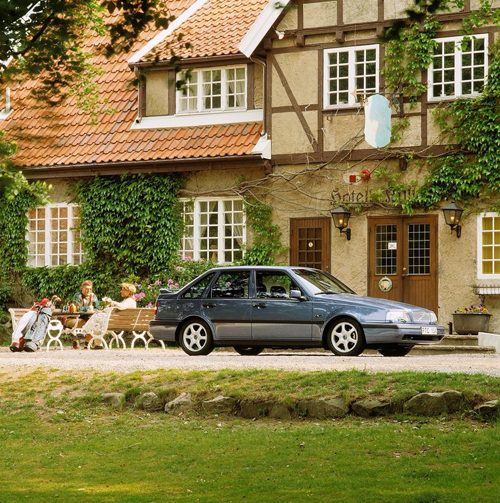 1995 – Volvo 440 at Kullagårdens Wärdshus near Mölle Golfklubb on Italienska vägen in Mölle, Skåne, Sweden. Kullagårdens Wärdshus is located on Italienska vägen in Mölle in Skåne, the south of Sweden. 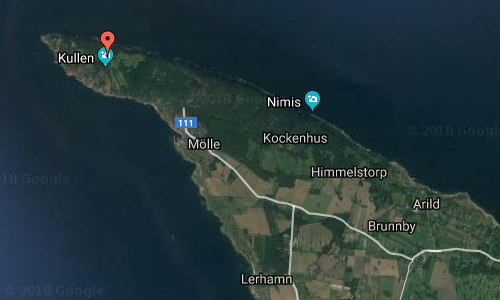 It is in the middle of the golf course of Mölle Golf Club, in one of Europe’s most beautiful nature conservation areas. Combine an undisturbed meeting, a relaxing weekend or a nice golfing round, staying at a Wärdshus that boasts a well-refurbished kitchen and an experienceful environment. 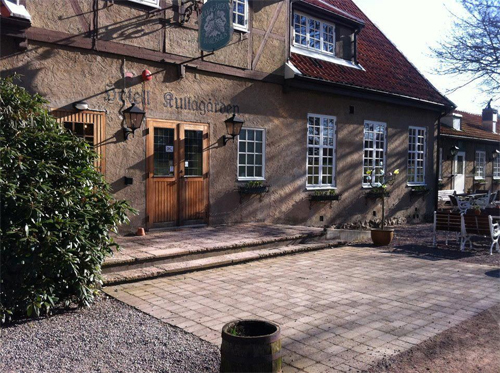 Kullagården is small, cozy and personal dating back to the early 1500’s. Here you will find 16 rooms and you live on the course, nice Mölle GK and 75 meters to the first tee. The ocean view from the hotel is magnificent. 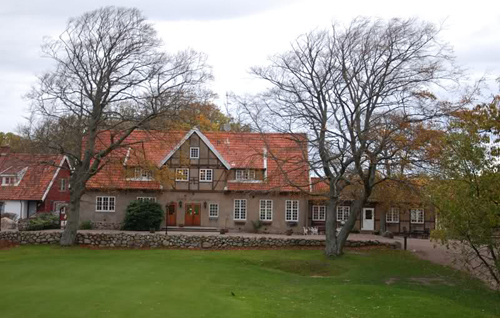 Several different golf packages are offered, where all include accommodation, food and golf at Mölle GK. Try the turn and taste buds in a stunning scenery with a golf course winding up and down the hills in northwestern Skåne. Golf packages focus on the golf as much on the food as well. You choose between a 2-course or 3-course fine-dining menu, and if that is not enough, why not turn it into a 5-course gourmet menu? 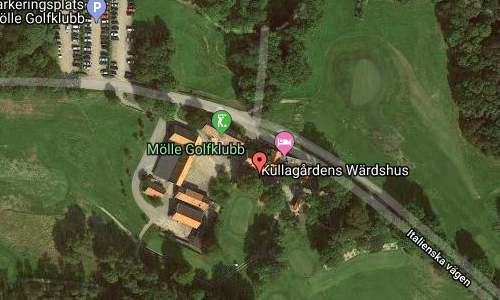 Before dinner you have probably played a round at Mölle GK. The course is not that long, it measures 5,292 meters from yellow tea. The difficulty with hilly fairways, relatively small and undecided greens makes even the best golfer a challenge on our golf course. Go to Skåne and Kullagårdens Wärdhus, you will not regret it! Kullagården is a historically famous farm,  located along the Italian road halfway between Mölle and Kullens fyr on Kullaberg. The farm has a medieval origin, and was first known as Kulla Gård. 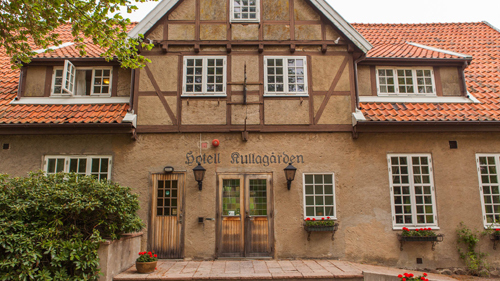 Kullagården was previously awarded to the person responsible for the operation of the coal fireman. In the early 1800s, Kullagården was divided into two farms, Gamla Kullagården, today known as Ransgården, and Nya Kullagården, where today Kullagårdens Wärdshus and Mölle Golfklubb are located. In the 19th century, Kullagården became the center of the early tourism of Kullaberg. Kullagården is located within the nature reserve Västra Kullaberg. It was formed in 1971 and is owned and managed by the state through the County Administrative Board of Skåne County. Together, the western and eastern Kullaberg nature reserves cover nearly 1,000 hectares of land and 300 hectares of water. The lighthouse of Sweden, Sweden’s highest and brightest lighthouse, is 500 meters west. 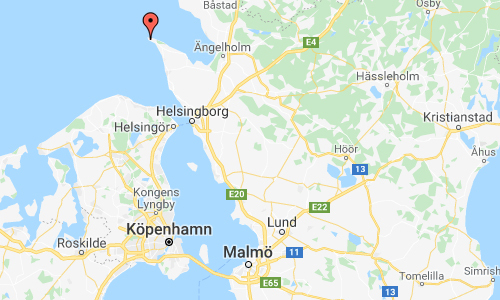 Bath and dive facilities are available at the many beach lakes that are located on the beach, such as Ablahamn, Josefinelust, Djupadal and Ransvik. Down at the edge of the coast there are a large number of caves, most of which were formed by the ocean’s impact on the rocks. At Ransvik, the first communal baths in Sweden took place in the early 20th century. There are hiking trails in the area, such as goes over the old heather fields, which have been rebuilt in recent years. More information at kullagardenswardshus.se and sv.wikipedia.org.